Uses standard HAx1 or 15x1 home sewing machine needles. In terms of design and engineering at the machine complies with the latest technology advances, it is easy to use. Machine is equipped with a convenient storage compartment for accessories, which stores the sets of needles, screwdriver, oil can, and other necessary stuff. Note also that the machine is equipped with a compartment for scraps of fabric. The package includes car cover that will protect your machine from external contamination during off-hours. When processing very thick materials you are using the lift lever to raise the presser foot can foot to a height of 6 mm. When working with different types of fabrics (light, medium, heavy), you can change the presser foot pressure. The stitch length can be adjusted as necessary from 1 mm to 4 mm by turning the stitch length regulator. 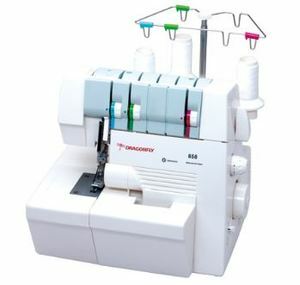 The machine performs a flat seam and 2-thread chain stitch. I want to say thank you to the entire staff and especially Mr.Douthart for the timely, attentive and courteous treatment I received during the return of a product. I was so impressed by the level of personal attention that was given to me throughout this entire process. Not one time did I feel as if my problem didn't matter. This group really knows the meaning of "customer service".